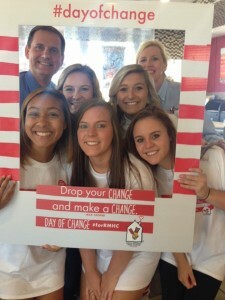 We are so happy with how successful Day of Change was #forRMHC! Our volunteers, staff and McDonald’s crew did an amazing job supporting the day and reminding customers the importance of giving. It is magical to see what just a simple smile can do and as we all know, what a little change can do. The way that the community stepped up and gave their spare change was inspiring. We had people bring in big plastic bags full of change, people donating because they wanted to wear our signature red and white stripe socks and even some people who had no idea Day of Change was going on, but wanted to learn more about getting involved with RMHCA. We wish we had the man power to be at every single McDonald’s restaurant in our area, but we just don’t. Making a BIG presence in 14 locations was amazing and we hope that each year we can grow and spread the word about the importance of Donation Boxes. We loved having HOT 107.7, JOX 94.5, 1070 WAPI, and 995 Nashicon radio stations on site helping us spread the word and even work the drive thru! 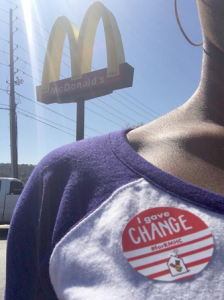 We were also so happy that so many Alpha Delta Pi Chapters got involved — even if they were not able to be in a McDonald’s restaurant like UNA’s chapter who set up areas to take donations on their campus. The numbers from the day will take some time to calculate and counting change is hard work, but we know we had a great day and that so many families will be touched by the change that was collected in just one day. Remember if you could not make it out for Day of Change — those Donation Boxes are there, everyday. You can give anytime you have spare change. 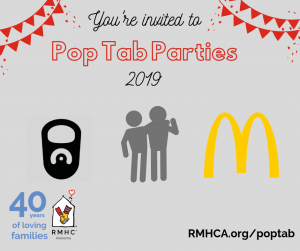 That money always stays local and it is all handled by a third party so you can rest assured it is making a BIG change in the families we serve at RMHCA. If you are interested in a pair of socks for a $10 donation, you can stop by our office at 1700 4th Ave S any weekday between 8-5. We are still getting pictures coming in, but we will be updating our Facebook album and Flickr account as we get them so don’t forget to check those out! If you have any pictures from the day, email them to laurie.smith@RMHCA.org. Day of Change is celebrated every year on October 15th, so mark your calendar for 2016!! THANK YOU from the bottoms of our hearts for all those who supported RMHCA yesterday (and everyday).